My name is Joseph Gonzalez, though I usually go by "Joe" and I'm 64 years old. I was born and raised in Miami, FL, and other than four years away in the military, I lived there until moving to GA four years ago. I am married to a wonderful lady, my wife of thirty-four years, Cookie, and we have a terrific daughter Alyse, 23, who is now working towards her BSN in nursing down in Orlando, FL. Cookie and Alyse are my biggest fans and attend most of my meets. While powerlifting is my passion, my hobbies include reading, cooking, listening to music (especially folk and acoustic music) and occasionally fishing (when it doesn't interfere with training). I now live in Newnan, GA. I train primarily at Atlanta Fitness, though I drive over to Eatonton, GA once weekly to train with another powerlifter/coach, my friend Al Reiss, at the Bodyplex gym there. When I'm down in FL, I train at Orlando Barbell (Al Reiss is a part owner) which is a serious, well-equipped powerlifting gym. I'm the housekeeper at our home as well as the head "chef". According to Cookie, I clean, cook, and iron very well! I am a retired firefighter, having served for 20 years with the City of Miami Fire-Rescue Department. A good friend, Charlie Paige, whom I met at Atlanta fitness and is a tremendous 148/165, Open bench presser, encouraged me to enter a meet, which I reluctantly did. I'll begin by saying my lifting is unremarkable, because as an M3A (60-64) I rarely have more than myself and perhaps one or two other lifters in my weight/age class. Having said that, since beginning to lift in USAPL and NAPF/IPF, four meets thus far, I've won two gold, a silver, and a bronze medal. I had similar success in WNPF masters competition. I hold GA state masters' (60-64) records in both equipped and unequipped categories. My training philosophy is first, quality vs. quantity training, honoring rest/recovery days and eating properly. Also, I keep an open mind, researching training and listening to advice from other lifters, in short a willingness to learn. That's not to say everything works or is applied, but I'm open to suggestions, even criticism. A typical training session would consist of one of the core lifts (Squat, Bench, or Deadlift) and two or three assistance exercises, I usually finish each session with abs and 15-30 minutes of cardio. Sets and reps depend on where I am relative to the meet and would be 2-5 sets of 1-5 reps for core lifts and 2-4 sets of 3-8 reps for assistance work. I compete both unequipped and equipped, though all of my deadlifts have been unequipped. I'm not sure how much a deadlift suit would help me, though I'm being strongly encouraged to try one, so we'll see. I have competed in 242, 220, and 105kg. I plan to continue in 220 and 105kg. I love training for and competing in all three. This is a "which of your children is your favorite?" question. If pressed I'll say deadlift. Very difficult to choose just one, but I'd say Larry Pacifico, Ed Coan and perhaps Paul Anderson though not a powerlifter per se. 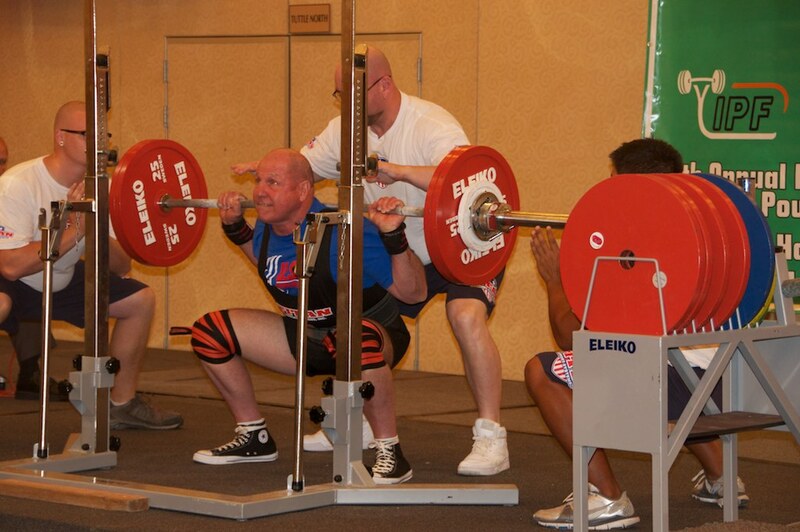 My last competition was the USAPL Bench Nationals, Sept. 4th and I won my class. The gentleman I was competing against didn't complete any of his attempts. I went 2 for 3, and my 297.6 lb was sufficient to win. I've entered and will compete in the USAPL Southeastern States here in Dalton, GA, Nov. 5-6, 2011. Depending on my time frame between meets, or prior to, I like to divide my training into 3 or 4 week segments where I vary set and reps schemes as well as assistance exercises. I do my last heavy deadlift workout at least 14 days prior to a meet. I also don't train much, very light if at all, the week prior to the meet, which is maddening because I enjoy training. I focus on keeping protein and calories sufficient for training and junk food to a minimum (tough to do some times). Protein is from chicken, fish, and some lean beef, while my carbs come from whole grains, fruits and vegetables. I usually eat 4-5 moderate meals daily. I try to keep my nutrition consistent year round. I take a good multi vitamin/mineral supplemet daily, glucosamine/ chondroitin, fish oil caps, and Creatine (for 6-8 weeks prior to the meet, and off one month after the meet). I'll be using a different, smaller bench shirt and squat suit, deadlift will probably still be unequipped. 2-4 although I'll hit 5 this year. That's an easy one to answer, Fear of failure. What advice & tips would you give to a powerlifter that is just beginning? If you are just beginning, what advice have you received from other lifters or coaches? Find an experienced powerlifter (male or female) in your gym or on- line and ask for advice. Some powerlifters, especially on-line, charge for advice and individualized training plans, which is fine. Most powerlifters, myself included, enjoy helping other lifters especially those new to our sport, for no other reason than others have helped us. Find a simple, uncomplicated program which concentrates on the three core lifts (e.g. Stronlifts 5X5) and stay with it, giving it a fair amount of time to work for you. Take rest/recovery days and eat well with respect to protein intake, and keep junk food (and alcohol) to a minimum. Finally think long term and be patient. Powerlifting has made me healthier and physically/mentally stronger. It also reminds me daily how fortunate and blessed I am to be able to do this sport. I also have met, through this sport, some of the nicest, most generous and unselfish people I've ever known. No, but I do stay in touch with lifters whom I compete with. I was strongly encouraged to compete in my first meet by Charlie Paige, and once I did, I was hooked. The 2011 NAPF/IPF North American Powerlifting Championships in Miami, FL where I was fortunate, and honored, to be part of the USA team as a masters lifter. My first full-power meet (WNPF) 2009 where I totaled 910. Charlie Paige, Al Reiss my training partner/coach and a couple of guys who unselfishly helped me at a meet before they knew me, Josh Rohr and Jeff Robison. The latter two probably don't remember. Yes, if I can do this sport, anyone in reasonably good health can as well. Joe, thank you for your time and best of luck in your upcoming powerlifting endeavors!